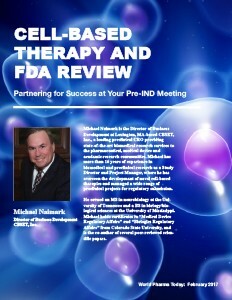 by Michael Naimark, Director of Business Development, CBSET, Inc.
Regenerative and cell-based therapies have only recently begun to deliver on the promise they have portended for years, creating opportunities to positively impact patient outcomes and professional success. In the same way that these new and exciting biological approaches have the potential to revolutionize therapeutics, their very novelty also poses new challenges and opportunities for those of us charged with their development. This is especially true for individuals and teams seeking to move toward the clinic with technology originating from academic collaborations. If you are a veteran of traditional small molecular pharmaceutical therapies preparing for your first regulatory marathon with the agency, you should familiarize yourself with some significant and valuable differences between how the process currently plays out in this still-developing area of regulatory review. This article provides tips on how to prepare and use the meeting to your advantage.